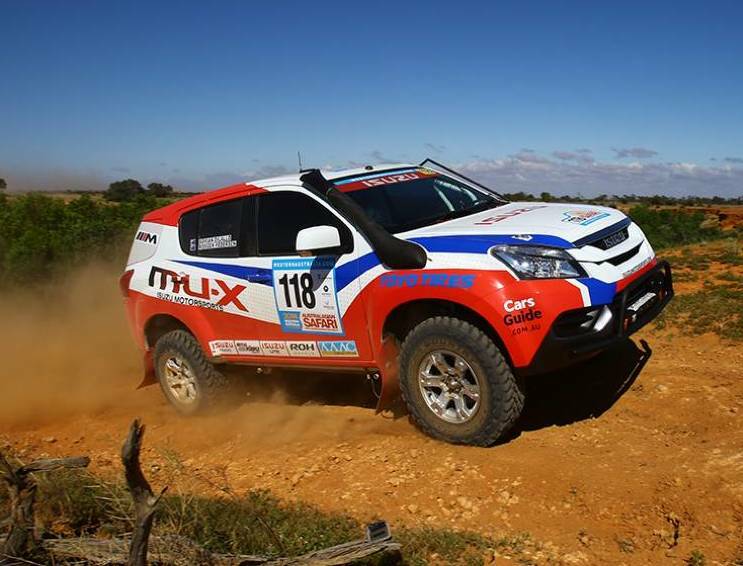 The Isuzu Motorsports team has managed to achieve three class wins in the 2014 Australasian Safari cross-country rally, with all five of their entries making it across the finish line at the end of the seven day, 3000km event. WA’s Adrian Di Lallo and co-driver Rodger ‘Roj’ Pedersen were the best placed of the three official Isuzu Motorsports entries, their production-class Isuzu MU-X wagon in fifth outright and first in class in their home state event. ‘Roj’ Pedersen says the final day of the event was the toughest stage of the week. Two kilometres into the stage it was pouring with rain and muddy. Bucketing down and really hard going. We brushed a tree and got lost – so did most others actually – and we lost a lot of time trying to find the right way, but we made it. Thailand’s Olan Sornsirirat and Veerachai Thorangkoon – the third team in the official ‘Isuzu trio’ – were second in class behind Di Lallo and Pedersen, and seventh outright in their D-MAX ute. Team leaders Bruce Garland and Harry Suzuki came in 17th and took a class win, despite missing two full days repairing their Dakar-spec Isuzu D-MAX (and being handed extra time penalties for failing to finish those days). Their car was halted by an electrical fault 37km into Day Three while running in fourth place. Aside from the strong results posted by the official Isuzu Motorsports entrants, the two other Isuzu crews being helped by the Garland/Suzuki team have also come home well. The Thai-entered D-MAX crewed by Vorapot Bunchuaylua and Chupong Chaiwan came home in sixth and first in class, while the Isuzu MU-X being campaigned by Safari stalwart Reg Owen and co-driver Russell Cairns finished second in the same class and 13th outright. Today was unbelievable with the rain bucketing down. A whole lot of us got lost and then Steve Riley [who had been leading the event] got stuck in a ditch and a bunch of us helped pull him out. We got soaking wet and covered in mud, but we still had a good time. That’s what Safari is all about. The 2014 Australasian Safari kicked off in Perth, with a ceremonial start, last Friday night and full competition began in Geraldton, 424km north of Perth on Sunday, September 21. Open to cars, buggies, bikes and quads, only 20 of the original 35 starters in the car category completed the course. Toyota Fortuna Ground Clearance Figures – What’s The Diff?